As an undergraduate, I was a member of Phi Delta Theta fraternity. Now that I’ve returned to my old stomping grounds, I’ve become involved with the local chapter again as the advisor. About two years ago, the chapter decided to take part in the national fraternity’s Iron Phi program, which raises funds for the ALS Association to raise awareness of and research for the disease commonly known as Lou Gehrig’s Disease. The ALS Association is the fraternity’s philanthropy of choice because as an undergraduate at Columbia University, Gehrig was a member of Phi Delta Theta. During the last two springs, the members have organized a three-day, 170-mile relay run that traverses half of Washington state – I tag along as an organizer, supervisor, driver and, occassionally, I'll even run. 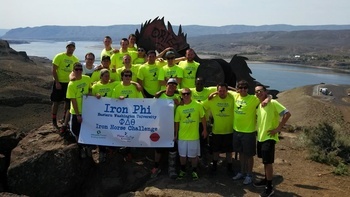 They participate in the endeavor with other Phi Delta Theta chapters in the state, with each chapter leaving from their respective campus and meeting on the banks of the Columbia River at the Wild Horse Monument in the middle of Washington. The “Iron Horse Challenge,” as it's been dubbed, has raised approximately $25,000 for Lou Gehrig’s Disease research and scholarships for undergraduate and graduate members. An interesting connection between my personal life and professional one in this respect, is that degenerative myelopathy in dogs is the canine equivalent of Lou Gehrig’s Disease in humans. Breakthroughs and research in each species hold the promise of unraveling the mysteries of mutation, symptomatic progression and treatment in the other. Several other Paw Print Genetics’ team members also raise funds and awareness for organizations fighting for research dollars and cures to diseases prevalent in humans. Lisa Shaffer, Paw Print Genetics’ CEO, and her husband, Jeff, the company’s president, have just this year supported the March of Dimes, STEM education in Spokane, specifically the Riverpoint Academy in the Mead School District, SCRAPS and the Spokane Police Department K9 unit. Blake Ballif, the laboratory and scientific director for Paw Print Genetics, is actively involved in his church and their philanthropic activities, including volunteering at food banks, working with area youth and participating in beautification projects throughout the community. Christina Ramirez, our medical director, routinely participates in the Susan G. Komen Race for the Cure, benefitting breast cancer. She also ran a 50k ultra marathon that helped a local elementary school. Kyle Sundin, our senior manager, development and laboratory operations, takes part in the March of Dimes walk that benefits premature babies. He can fully appreciate the impact and good the walk has on real-world patients, as he and his wife had a daughter and twins that were premature and spent time in the NICU. Lacy Crowder, Paw Print Genetics’ director of finance, volunteers for the Inland Northwest Lighthouse for the Blind, which employs, assists and empowers people in the blind and deaf community. Casey Carl, the assistant medical director, and a big-time gamer, has pulled a marathon of his own – gaming for 24 hours straight to raise awareness and funds for the Extra-Life Organization benefitting the Children’s Miracle Network. Ashley Connors, our laboratory technologist, for the past several years has participated in the Northwest Walk/Run for Epilepsy. Melissa Krug, also a laboratory technologist, has volunteered at Spokanimal, our local humane society. She has helped in many different capacities, most recently working to find forever homes for the shelter’s residents.